﻿National Dog Day: Calendar, History, Tweets, Facts, Quotes & Activities. National Dog Day serves to raise awareness of the thousands of dogs that need to be rescued and encourages appreciation for family dogs and working dogs, such as bomb dogs, service dogs, rescue dogs and law enforcement dogs. Dogs are owned by many families in the US, however many other dogs are homeless and or have been abandoned. Every year, these dogs are taken into shelters, where millions of them are euthanized. In the US, approximately 3.9 million dogs enter animal shelters every year, of these, 1.2 million are euthanized. Only 35% of shelter dogs are adopted, 26% are returned to their owners and 31% are euthanized. 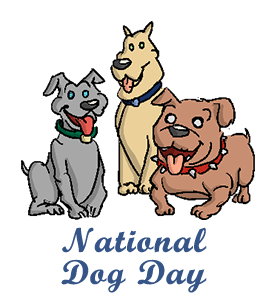 In 2005, National Dog Day was conceived and promoted by Colleen Paige, a pet lover and advocate. At one time, Iraq and Afghanistan had about 1,200 dog teams in action. When the war dogs are involved, the bomb detection rate can be as high as 80%. It is estimated that there are 13,600 animal shelters in the United States. According to the American Human Association, the most common reason (29%) for giving up a dog is because their place of residence does not allow them. Only 10% of animals that enter shelters have been spayed or neutered. Adopt a dog. There are local shelters in most counties that pick up strays or take in animals that have been given up or abandoned. Visit your local shelter to pick up a new companion. Donate to one of many organizations such as, the Humane Society or the ASPCA, that help animals in need. You can also donate blankets, pet food and toys to your local animal shelter. Volunteer your time at your local animal rescue shelter. Most shelters operate with volunteers. There is always a need for help walking, feeding, playing with and cleaning up after the animals. Sign your dog up for dog training classes. There are many options from confirmation, obedience, rally, hunting, agility and utility, amongst others.